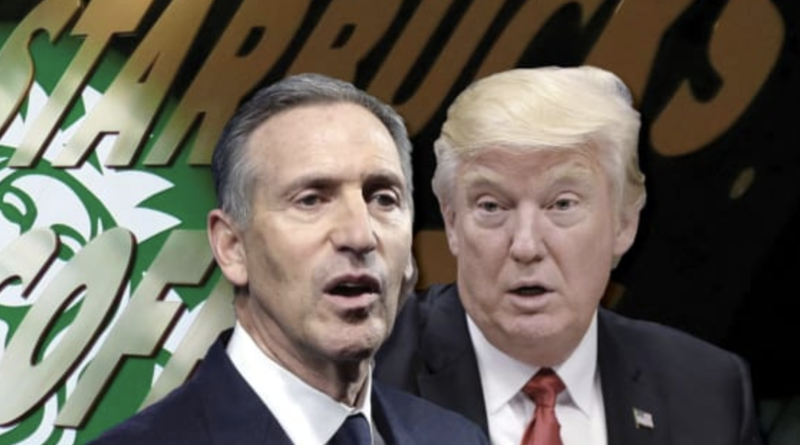 In what looks like an attempt to bait Howard Schultz into making good on his plans to run as an independent candidate in 2020, President Trump taunted the former Starbucks CEO in a tweet, saying he doesn't have "the guts" to run for president. As we previewed on Sunday, CBS introduced Schultz and his presidential ambitions to the broader public late Sunday in an interview where the laid out his reasons for wanting to run as an independent. As Schultz argued, a focus on "revenge politics" by both parties has brought the American system of government to the point of total dysfunction. And while Schultz said that Trump clearly isn't "qualified" to be president, the Democrats also shoulder some of the blame for the state of Washington. Neera Tanden even went so far as to threaten a boycott of Starbucks if Schultz enters the race (apparently she missed the reports about Schultz leaving Starbucks last year), according to CBS. Others have griped about Schultz effectively handing Trump a second term if he garners enough support to peel votes away from the Democrats. "I have a concern that, if he did run, that, essentially, it would provide Donald Trump with his best hope of getting reelected," 2020 hopeful Julián Castro told CNN's State of the Union on Sunday. "I would suggest to Mr. Schultz to truly think about the negative impact that that might make." Neera Tanden, the president of the Center for American Progress, put it more bluntly: "If he enters the race, I will start a Starbucks boycott because I'm not giving a penny that will end up in the election coffers of a guy who will help Trump win." In addition to taunting Schultz, Trump also joked that he hoped Starbucks is still paying its rent to Trump Tower - a veiled shot at the company's hypocrisy. Any voters who think they might be interested in supporting Schultz can watch a clip from his CBS interview where he offers an outline of his campaign platform. But while Schultz isn't the first billionaire to flirt with a presidential bid, we imagine his pitch that the American people, who have been readily embracing populism on both the left and the right, are looking for a billionaire to save them from themselves will prove incredibly popular in the current climate.